Q. What is the aim of the initiative? A. 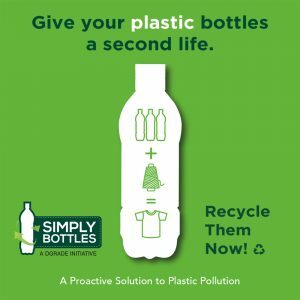 The goal of the Simply Bottles initiative is to increase recovery rates of PET plastic water bottles so they can be recycled into polyester yarn to create a closed-loop supply chain. Simply Bottles provides schools, businesses and other organizations with educational and awareness tools, as well as support in establishing a process for PET plastic collection. A. Plastic pollution has become a prominent news topic in the past year, resulting in campaigns encouraging a complete ban on plastic. Through Simply Bottles, DGrade demonstrates how plastic is still a viable and useful material if recycled into a second-life product. Recycling PET plastic into polyester yarn not only prevents plastic from going into landfill, it saves energy, water and oil and produces lower carbon emissions than virgin polyester yarn manufacturing. Q. Why is DGrade and Simply Bottles different? A. We work with local waste management companies to collect and report on the quantities of PET collected, Simply Bottles offers a key differentiator from other recycling initiatives which may not necessarily evidence that the waste has been recycled into second-life products. Simply Bottles concentrates on recycling plastic water bottles so it is easy for consumers to identify the type of plastic… which in turn, limits contamination and ensures segregation from other types of recyclables and waste to facilitate the recycling process. The ultimate goal is for the PET collected through Simply Bottles to provide feedstock for the world’s first bottle-to-yarn manufacturing facility in the UAE, planned for 2020. The initiative is off to a great start, with 35 schools in Dubai registered and more joining every day. The Simply Bottles school program is officially sponsored by Oasis Water, a market leader in the water category with a commitment to reducing their impact on the environment. The next step for Simply Bottles is to bring businesses on board, particularly from the hospitality and event industries who are significant consumers of bottled water.